In part 1 I tried to prove how much openings influence our results. A logical follow-up is how we can study openings. Despite we can buy many openingbooks, almost no literature exists about how we should study openings optimally. An exception is an article on the Quality Chess Blog of Nikos Ntirilis mentioning a few handy tips. 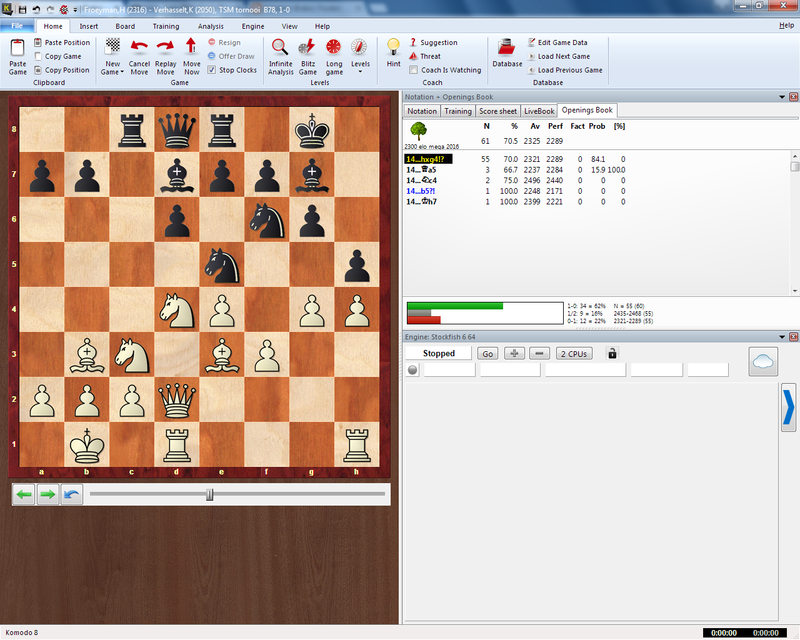 I agree with him that playing games is doubtless one of the best methods to study openings. However if we want to avoid losing a lot of rating then we better test an opening in competitions not counting for rating. Playing online games like mentioned in my article the (non-) sense of blitz can be a solution. An alternative is to play chess against an engine as Nikos recommends and which I did myself years ago (see my article chesscompositions). The preparation of games (e.g. by using databases) is a method costing neither ratingpoints but is perceived by a lot of players as less attractive. Nevertheless if you use a proper system of archiving then it is possible to build up a nice repertoire after some time. Of course a nice supplement is reading openingbooks. In that domain Quality Chess played a major role by improving the overall standard of openingbooks compared to a decade ago. Often the quality is so good that you can be considered an expert after reading the openingbook on the condition you are sufficiently motivated and concentrated. An example of a success-story was described in my article an expanded repertoire for black. Obviously ambitions play an important role too. A lot of people are surprised when I tell them that I haven't bought any openingbooks in decades which doesn't mean that I have no ambitions anymore. I analyze my games thoroughly with the help of engines and summarize those analysis by comments and annotations. Nonetheless I admit that only since a few years I really make a serious effort analyzing the openings methodically. Today I have developed my own methods allowing a much profounder analysis of the openings. I see recently already quite some progress not only related to mistakes but also in creating surprises for my opponents. This method seems to me something interesting to elaborate upon in this article. If I would be asked to describe my method in 1 sentence then I would tell them that I analyze 100 mastergames of 1 opening with my best engines and complement it with analysis of correspondence-games, engine-games and games I played online with the same line. Some explanation about what I consider mastergames is probably necessary to get a better understanding. I use as filter that at least one of both colors must have + 2300 elo. I expect some grandmasters find this filter too weak but I often see an interesting opening-idea of a player rated just above 2300 elo. Besides I also get a better picture of what players of 2300 would normally play in that position and 2300 players are an important segment of my regular opponents. On the other hand using a weaker filter would deteriorate enormously the return. I am satisfied with my choice but sometimes I do miss an interesting old mastergame (when ratings didn't exist yet) even if only for the historical background. A second limitation is to cut off the analysis of the opening at about 100 mastergames. Time simply doesn't permit me to go broader. To process 100 mastergames can easily take a week and each year I want to do dozens of such projects. I select the 100 mastergames counting backwards from the last position popping up simultaneously in my game and a mastergame. An example will probably clarify a lot. At move 28 I played a novelty in my game against Karsten Verhasselt see article mistakes but I already start the analysis of the opening at blacks 14th move. So creating an openingbook is not only handy for a preparation but also to study openings. I do have to admit that it took me a lot longer to create such openingbook than a few years ago as explained in my article green moves. I don't know if this is related to the complexity of the megadatabase 2016 but this time it took 3 full days to build the openingbook. Fortunately I just had to wait for the result as otherwise I surely gave up. The gain in time with the openingbook is enormous. The countless searches during the study are executed instantaneously and you get as bonus an exact overview of which moves are the most interesting ones to analyze deeper. This brings us to the 3rd filter I use in my openinganalysis. An idea will be ignored if every mastergame scored badly (definitely lost games). I am aware that this sometimes means I miss a good idea but the gain of time largely compensates. By cutting smartly the tree of variations I can optimize the quality and work. A recent example from my practice shows well how this works. We zoom at move 16 of my game against Hendrik Ponnet, played in the Belgium interclub a couple of months ago. I try to find an improvement as I wasn't satisfied about the resulting position out of the opening. Despite a score of + 60% in more than 100 games so a lot of won games by white, I could not find anything interesting. It doesn't happen often but sometimes I have to return back further. I won't stop stubbornly at the number 100. 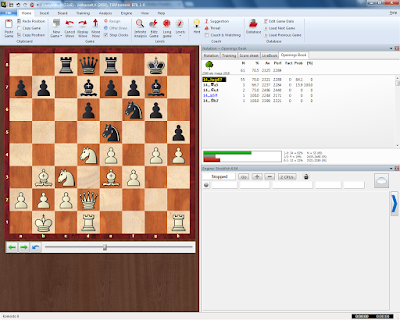 In such scenario it is absolutely necessary to summarize the analysis afterwards so it can be reused in a preparation of a game as can be seen below. I do take care that I store the detailed analysis in a separate database so when I want to expand or refresh the analysis that I can continue where I left off earlier. It doesn't make sense to analyze all the mastergames of an opening when you already did 95% of it 1 year ago. If that happens I will just analyze the 5% new games. Old analysis of 10 years ago always have to be redone but at that time I didn't make the analysis so detailed as I do today. Once the mastergames are processed, I will also analyse correspondence games played with the same opening which are often very valuable. A bit less relevant are games played by engines but as their current level is so strong you can't ignore them anymore as I explained in my article computers achieve autonomy. Finally I also have a look at my own online games. Scientifically they are not important but they have often a practical value to know which human errors occur often. I try to avoid my own errors while I learn the sometimes difficult engine refutations of the mistakes of my opponents. I admit that despite the shortcuts which I use, a project is not something which most players will enjoy. Besides you don't need such analysis at all to play at the level I do (2300 elo). It is neither very practical as the number of projects is limited so big gaps remain in my repertoire. My motive is to analyze with a scientific approach. A nice bonus is to have some fun with the mistakes from recently published openingbooks (e.g Lars Schandorff) or new correspondencegames.